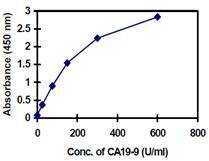 ab108642 Cancer Antigen CA19-9 Human ELISA Kit is intended for the quantitative determination of the Cancer Antigen CA19-9 concentration in Human serum. A group of mucin type glycoprotein Sialosyl Lewis Antigens (SLA), such as CA19-9 and CA19-5, have come to be recognized as circulating cancer associated antigens for gastrointestinal cancer. Cancer Antigen CA19-9 represents the most important and basic carbohydrate tumor marker. The immunohistologic distribution of Cancer Antigen CA19-9 in tissues is consistent with the quantitative determination of higher CA19-9 concentrations in cancer than in normal or inflamed tissues. Recent reports indicate that the serum CA19-9 level is frequently elevated in the serum of subjects with various gastrointestinal malignancies, such as pancreatic, colorectal, gastric and hepatic carcinomas. Research studies demonstrate that serum CA19-9 values may have utility in monitoring subjects with the above-mentioned diagnosed malignancies. It has been shown that a persistent elevation in serum CA19-9 value following treatment may be indicative of occult metastatic and/or residual disease. A persistently rising serum Cancer Antigen CA19-9 value may be associated with progressive malignant disease and poor therapeutic response. A declining Cancer Antigen CA19-9 value may be indicative of a favorable prognosis and good response to treatment. Our Abpromise guarantee covers the use of ab108642 in the following tested applications. ab108642 has not yet been referenced specifically in any publications. Publishing research using ab108642? Please let us know so that we can cite the reference in this datasheet. Can I use the kit ab108642 with plasma samples? I am sorry I could not find a document where it say the kit is tested with plasma samples - this might not have been tried in past. I would recommend using this kit as we discussed on phone; I don't see a reason why this kit should not work with plasma samples. Please let me know if you experience any problem. Our customer purchased ab108642 and she would like to know if standard is recombinant or endogenous protein. I can confirm that The CA19-9 standards in the ab108642 kit are prepared from partially purified CA19-9 antigen. The source is human fluids, not a recombinant protein. The standards are calibrated against other kits. I hope this information is helpful. If you have any further questions, please do not hesitate to contact us. What is the volume of Enzyme Conjugate Concentrate (12X)? We sincerely apologize that there has been an error on the datasheet information. The Enzyme Conjugate Concentrate (12X) component volume is 1.1ml, not 2ml as previously stated. Please rest assured that the volume is more than sufficient for your experiment and we regret that the error was not corrected earlier. Thank you for your message and inquiry. I can confirm that in this assay (ab108642 - Cancer Antigen CA19-9 Human ELISA Kit) the same antibody is used for both capture and detection. The subclass of this antibody is IgG1. secondary antibody originated from. I have looked for this information in the protocol booklet but I don’t seem to find it. Thank you for letting us know. I am very sorry to hear that you have been experiencing difficulties with this products (ab108642: Cancer Antigen CA19-9 Human ELISA Kit). We have been using Corning's micotiter plates for more than 15 years. This is the first time we heard that the strips fall off from the frame. If we hear more of the same problem happens to our other customers, we will do some investigation. The second antibody is a mouse monoclonal. If you need any further assistance, please do not hesitate to contact me again. Thank you for your inquiry. I am happy to confirm that this kit is normally used with neat undiluted samples. The standard curve ranges from 0 - 600 U/mL with a estimated minimum detectable concentration of 10 U/mL. This kit is for research use only, but healthy men and women are expected to have CA19-9 levels below 35 U/mL. Some cancerous/disease state samples will have levels outside the upper limit of detection. When testing the kit in house, we normally perform a 1:10 and 1:20 dilution for re-testing the out of range samples. Serum samples demonstrating gross lipemia, gross hemolysis,or turbidity should not be used with this test. We offer bulk discounts from 5 items. I send you a quotation for four items as requested. When you decide to order please contact our customer service team(mailto:orders@abcam.com). I hope this information is helpful and wish you a good start into the new year. Thank you very much for your email. It seems that wehave sent the updated version of the productwiththe non-updated version ofproductdatasheet and protocol.There have been few changes in the protocol that were not updated on the website. We sincerely apologize for the delays. Please find attached the latest version of the protocol that we should have sent with the product. The kits are absolutely fine to use with the attached protocol. I would suggest using the kits as normal and contacting us again if any of these kits fails. If however this error has already affected your experiment then pleases contact me again asap I will be happy to arrange credit notes or free of charge replacement kits. Once again I apologize for the error; please do contact us if you need further assistance. Best of luck with your reserach. Have a prosperous New Year 2012. Phone enquiry regarding to standard samples provided with the kit (labelled 1-6). Which contains which concentration of CA19-9 standard? Sorry for the delay in getting back to you, I now have confirmation of the information requested. As we had assumed, the standards are labeled 1-6 from 0 to 600 U/mL, i.e standard 1 contains 0 U/ml, standard 2 contains 25 U/ml and so on with standard 6 containing 600 U/ml. I apologise for any confusion in this regard. Thank you for bringing this issue to our attention, we will be updating the datasheets accordingly. Please let me know if I can be of any further assistance. Thank you for the CA19.9 ELISA kits (cat: ab108642) we have now safely received them. I just had one question, on these kits it doesn’t specify the expiration date of the kits or the reagents. Could you please send me the expiration date of these kits so that I can make a note of them on my lab study book. Thank you for your inquiry. This kit has a shelf life of 1 year. For the lots that you ordered, we would expect them to be good until October 2012 when stored properly. I hope this information helps. Please contact us with any other questions.